Why such a long-winded discussion of a 2 second moment from a show that hasn’t been on TV in years? Like most people, we don’t think about Night Cheese often, if at all, but then we were approached by Carey Polis, the Digital Director at the food publication/juggernaut Bon Appetit, who wanted to do a class about Night Cheese. 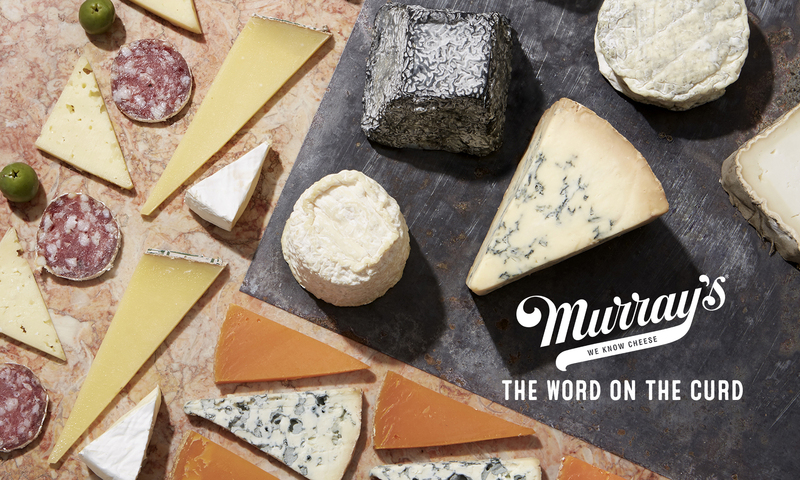 First up was Murray’s La Tur, a creamy, luscious cheese that is so delicious, it’s easy to lose track of how much you’re enjoying. Luckily it’s nighttime, you’re alone(ish), and judgment over amount of cheese consumed means absolutely nothing. 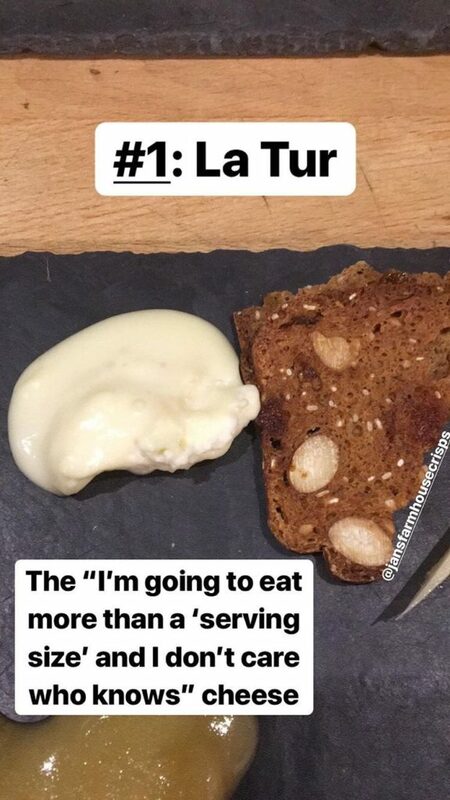 The caption says it all—this is cheese meant to be eaten far past its serving size. Later on, we tried the cornerstone of the Night Cheese pantheon: Boursin. Because we’re human beings, we love Boursin in all its herby, garlicky, spreadable glory. However, we don’t sell it. 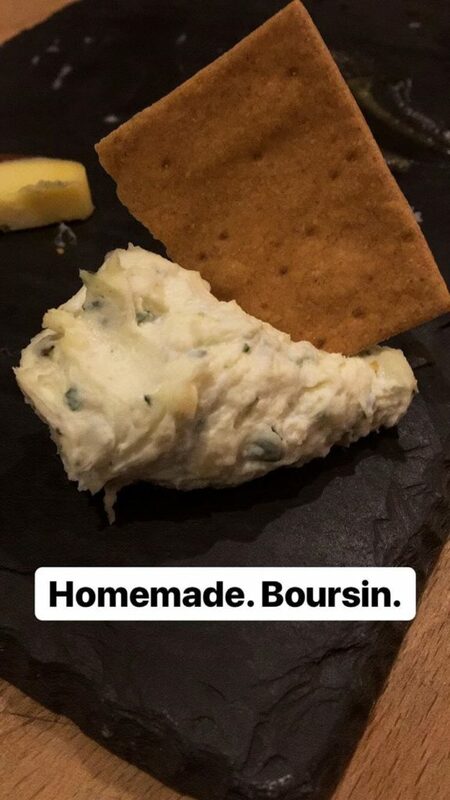 Our executive chef, David Elkins, whipped up this homemade Boursin just for the class and it was even better than the original. We aren’t selling his creation, but we DO sell a spreadable cheese that hits all those Bourin-y flavors you’re looking for, and it happens to be one of our favorite snacking cheeses (read: Night Cheeses) right now: Meredith Dairy’s Marinated Feta. In addition to cheese nicely laid out on our boards for tasting, we also had a wheel of Jasper Hill’s Harbison on each table accompanied by potato chips, because you can’t talk lovable cheeses without Harbison, which literally comes in its own bowl, and can be warmed up to make a single serving fondue (we know, it’s a life-changing move). 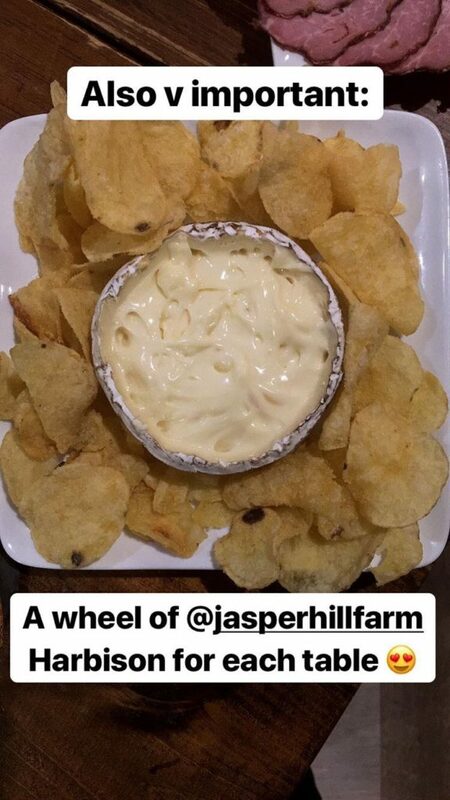 Night Cheese is now a permanent part of our lives, thanks to Carey, and we’re proud to have devoted a night to it. If you want to drink and eat delicious cheese, or love the idea of learning about cheese, check out our upcoming class schedule here, and be sure to follow us on Instagram for more glimpses into future classes! Next PostNext I Fonduel, Do You Fonduel?